In this topic you will learn how to add audio tracks to videos using the Media module. Multiple audio tracks are supported for HLS V4+ and DASH - with and without DRM protection. Videos with multiple audio tracks will display a headphone icon ( ) in the controlbar. When the icon is clicked, the viewer can select between audio tracks. Note: Multiple audio tracks can only be used with videos set up for Dynamic Delivery. In addition, your account must be enabled for multiple audio tracks. Contact your account manager for details. When a video is uploaded using a Dynamic Delivery ingest profile, the source audio for the video will be transcoded according to the ingest profile and will appear in the Audio Tracks section for the video in the Media module. By default, the audio Language is set to English with a Variant type of main. The defaults can be changed by Brightcove Support. Additional audio tracks can then be added. Below is an example of a video that has been configured with multiple audio tracks. Note: Multiple audio tracks can also be added to videos using the APIs. For information, see Implementing Multiple Audio Tracks Using the APIs. 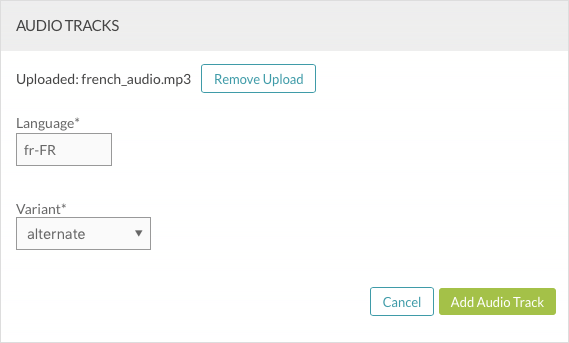 Audio track files can be uploaded and hosted by Brightcove or reside at an internet accessible URL. Click the video title link and locate the Audio Tracks section. The audio track for the source video will appear. Click Edit or double-click in the section. 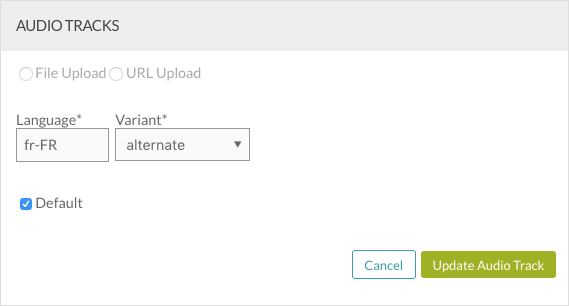 Select if the audio track file will be uploaded from the local file system or from an external URL. 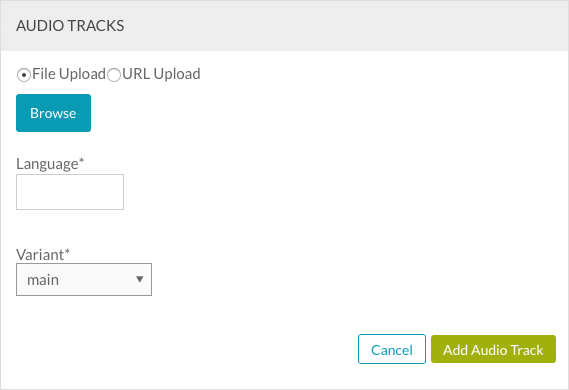 File Upload - Click Browse and select the audio track file from the local file system. The file will be uploaded to Video Cloud. URL Upload - Enter the public URL where the audio track file resides and then click Upload. The file will be uploaded to Video Cloud. Note: Audio track file names with parentheses, question marks, quotation marks, spaces and other special characters will silently fail when uploading. Brightcove recommends using file names without special characters. The Language field should contain the language code that specifies the language of the track text data. Click Add Audio Track to save the audio track information. Click Add Audio Track to add another audio track or Save to save the audio tracks. Note: Changes made to the audio track properties may take up to 15 minutes to appear in published players. To delete an audio track, click the delete icon ( ) next to the audio track. Note that there may be a delay before the UI is updated and the audio track no longer appears. When a video with multiple audio tracks is published, a headphone button ( ) will appear on the player chrome. Click the button to select an audio track. Click Edit or double-click in the Audio Tracks section. Click on the track that is currently the default audio track. Click on the track that will be set as the default audio track. Smooth Streaming URLs will not be available. It is not possible to select which audio track will be used for distribution. The track included in the video source (the muxed in audio) will be used, always. We support one audio track from the source supplied in ".master", and one for each source under ".audio_tracks.masters". As soon as a video track is added, DRM protection will be enabled. We do not support custom labels for audio tracks. If you require that, you will need to make the change on the client side via the Player API. When the video is played back using the Silverlight plugin (in versions of IE less than 10, or any version of IE in versions of Window less than 8) - multiple audio tracks are not supported in Silverlight. If the audio and video are different durations, the player will may stop whenever the shorter one runs out. The video duration reported by the catalog/Playback API may be incorrect if the audio tracks have different durations.